From sheep or other wolly beeings that are not going to be dinner. Some of the shops on this list are breeding animals and selling them (And they might or might not become food at one point.) For some, this might be an issue. And to tell you the truth, I´m not 100% comfortable with it either. But, people who sells wool from slaughter-free flocks are few and far between. So maybe we shouldn´t be to difficult? If we raise the demand for slaughter-free wool, we might be able to change future sheep farmers way of life and that is something we should keep in mind. But again, whatever you choose, do what feels right for you! The companies marked with * has said that they do not sell the offspring. That might be the case with some of the others as well, but this is not yet confirmed. There are so many beautiful yarns that are not harvested from a living being. And if wool is not for you, there is no reason why you shouldn´t be knitting. I would however advice you to take a close look at what you purchase as a substitute for wool. Yarn with acrylic or other non-natural content gives off microplastic particles that does great harm to a multiple of living beings. It might seem like our personal yarn choices makes little or no difference at all if you look at the big picture, but a little goes a long way. If you are somehow not familiar with microplastics, I urge you to read this article from The Guardian. It talks about a lot more than clothing, but it is (or should be) a wake-up call. If you have stores or yarns you want to add to this list let me know and I´ll keep it updated. If you have comments or corrections on the companies mentioned in this post let me know, and I will investigate further. And remember: Ethical yarns may be a bit more expensive than other yarns, but do you really need a gianormous stash? A lot of the yarn I´ve hoarded in the past is just laying around. If I spend my yarn money on ethical yarn and only (or almost only, because face it, once a yarn harlot always a yarn harlot…) buy yarn for spesific projects, it will not be all that expensive. A blog post written in Guilt Free Vegetarian about the topic of ethical wool that one of my podcast watchers showed me. I knitted my first sweater with ethical wool this November. And it was a wonderful experience! The yarn I used was Izzy Lane in the natural grey colourway. At first I wasn´t sure about what I thought about the wool. It seemed a bit scratchy, but I have experience with other wool yarns that appear scratchy at first, but that blooms after wash and wear, so I carried on. It was a pleasure to knit with. Not splitty at all, and the knitted fabric got a nice halo. I haven´t worn it enough to comment on the amount of pilling yet, but all my woolies tend to pill, so I will get back to you on that. “During an encounter with an organic producer I discovered that farmers were burning and burying their wool in protest. The pittance they were paid didn’t even cover their shearing costs. One look around the High Street showed very little wool and no British wool at all. What there was, was being imported from Australasia where there is dubious animal welfare with the practice of mulesing commonplace and the live export of hundreds of thousands of animals to the Middle East. I decided I would start a British fashion label using wool. I pieced together the chain of processors I would need. It took a long time. There were weavers, spinners and dyers, shutting down on a daily basis. I found the last of 52 worsted spinners in Calderdale – now shut. I tried to find a button maker, there used to be hundreds in Birmingham, the only remaining one was a working museum. Eventually in 2007 I launched my brand Izzy Lane with two imperatives – to help save the British textile industry – and closer to my heart – to give animals a voice in the fashion industry, as they had none. Up until now, there had been no traceability whatsoever of animal fibre. As well as creating a cool fashion label, Izzy Lane was also a powerful platform to raise awareness and campaign for animal rights. It went on to win RSPCA Awards in 2008 and 2012, New Designer of the Year at the RE Awards and were finalists in the Observer Awards, the Daily Mirror Animal Heroes Awards and the Global Sustainable Luxury Awards. It has received extensive national and international press and was featured in two series of ITV The Dales and other BBC TV and radio shows. Our collections have been exhibited at London Fashion Week and in Paris, Milan, Berlin, Amsterdam, New York and Las Vegas and in a catwalk for the Queen ! I knitted a pattern that is so far only available in Norwegian. It´s called Løvfallgenser and it´s made by Strikkelisa. I didn´t have any plans to knit a sweater, but then I saw this on Instagram and I just had to buy the pattern the same day it was released and I started knitting it right away. It´s a top down construction, and that is, by far, one of my favorite ways to knit sweaters! When I weighed my sweater I was surprised to find out that it only weighed a little less than 300g. That means that I used just 6 balls of yarn! As far as my fear that the sweater would turn out scratchy goes, I just wore it with a simple strap top underneath the other day, and it didn´t scratch at all once it got the same temperature as my skin. I find that this is a issue I´m having with all my sweaters. Cold wool clothes always tend to feel a bit rough next to the skin before they are warmed up. It´s hard to say what will be scratchy or not, people are different. But this is not merino soft wool. If you are afraid that it might not be for you, order a ball, you could maybe knit a swatch, try to wash it and see what you think, or what whomever you are planning to knit for thinks? I know that Izzy Lane has a beautiful yellow color in their range, so I´m definitely using this yarn again! Thumbs up! This fall I knitted mittens for my mother´s birthday in November. I knew she had worn out the ones she knitted for herself, and I also wanted to try knitting with some of my ethical yarn. The yarn I knitted these mittens in is from Hooligan Yarn. “It’s essential for the welfare of sheep that they’re shorn at least once a year, but the fleece is often disposed of or given away for next to nothing. I liked the idea of producing a ‘single sheep’ yarn that promoted a high welfare message. The boys were originally called The Hooligans because of their boisterous behaviour and unerring knack of seeking out trouble, and although the girls are generally better behaved, they also have their moments. And so Hooligan Yarns was born! I got the most lovely package when I got the yarn I ordered. Pictures of the sheep, in this case from the sheep Guthrie who is a Gotland sheep. (The yarn is a DK ply with 160m per 100g ball from their spring 2017 shearing.) And a story about who Guthrie is. Truly charming mail! My mother has by now used the mittens many many times, and she can confirm that they are warm and that they have felted by wear to be perfect for dog walking! And I have enough yarn left to knit another pair of mittens! I will not talk at length about this in my podcast, just because English is not my mother tongue, and when it comes to topics as this one, I find that it´s hard to find the right words on camera. Just because I have to use some time to find the right ones. Trust me. I tried. So I will refer to this post in my podcast, and if you are curious, you are probably reading this right now. If you have been following my podcast since the beginning, you will probably have noticed that animal welfare and life is very important to me. I started out as a half-way vegetarian when I was 11, and since then I´ve been excluding more and more animal based food from my diet. I´m 35 years old, now, so it´s been a process for sure. I tried out a vegan diet this January, and I was surprised by how easy it was. And how good I felt doing it. So I just continued eating vegan. 95%. I have eaten a few meals with milk and eggs when visiting Thomas´ family. But I´m gradually avoiding animal based products outside of my home as well. All of this got me thinking. I´ve been telling myself for years that I could use wool, because no harm comes to animals when taking their wool. That wool is just a by-product and all that. But after my silk discovery, I couldn´t just assume that it was all good. After a few weeks I´ve come to the conclution that my shopping habbits as far as wool and yarn goes, will change a lot in the future. I will use or sell what I have in stash. And once that yarn is gone my stash will look a bit different. I will use my woollies, and if I´m gifted woolies I´ll most likely wear them. But I will not support the industry with my own money. Most vegans I know of will not use any product from animals. I will however use wool, if it´s the right one. Acrylic yarn will never find a home in this house. Plastic yarn is not an option. Not all plant based fibers are good for the environment. Research is needed. I´m on it. I´ve found a few web shops in Great Britain that sells slaughter free yarn from happy sheep. I´ve also looked into a few plant based yarn blends. Which I of course will talk more about in my podcast. This is not an easy thing to do mind you. 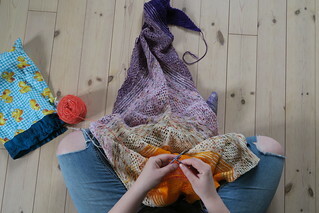 I feel like I´m missing out on a lot of fun yarn. But my mind will be at ease. And the patterns are mine for grabs hot yarn or not. And I´ve decided to enjoy my new journey to the fullest, proving that one can be a happy knitter without all the latest trend yarns. And I hope you´ll keep following my adventure in the future. Needless to say that unless I find a slaughter free way to get my hands on yarn for dyeing, I will not dye more yarn for sale. So no updates with yarn in my etsy shop for a long time, if ever. As I said, I will be knitting with stash yarn for quite a while, so the change of mind will be gradually introduced in the podcast. What are your thoughts about this? I´ve made up my mind, but I´d like to hear your thoughts if you have any. Are any of you vegetarians or vegans, and what are your thoughts? And one last thing: If you know of any slaughter free wool or alpaca yarn shops online, I hope you will tell me. They are few and far apart as far as I can tell.